Book publishing has changed dramatically over the last twenty years and if you are a long time author with published work and contracts you need to inventory all your agreements and do some serious thinking. New opportunities have emerged and you can take advantage of them. Let me sketch the big picture, which has two foundation blocks. Copyright in most cases is the life of the author plus 70 years, so your copyrights are in force. This is your property, only you have the right to exploit it. The second foundation is that books can be reverted from their original publishers and inexpensively re-published as ebooks. These books do have financial potential and as they are distributed and promoted over the internet there is a ready, permanent market that can be accessed at very low costs. For all your books that are in print with a traditional print publisher you need to know how the books are doing, what subsidiary rights have been licensed and what rights your publisher retains control of. Auto-pilot is not a good strategy, you should know how your books are doing and be ready to see if your publisher can support them. For books that can be reverted to you or have been reverted, you need to consider their potential as ebooks, print on demand editions and other opportunities that exist now or may emerge. Are my books in print? What formats are in print–hardcover, trade paperback, mass market paperback, ebook, audiobook? Are my books in print in all the right formats? Are my books ever marketed or promoted? Am I receiving royalty statements? Am I making any money? Can any of my books be helped by a new cover or price change? What subsidiary rights has my publisher sold? What is the status of those licenses/editions? Are they making any money? If they are translation or audio licenses have I seen the royalty statements? In our experience at my literary agency we have seen substantial revenue generated by ebooks and audiobooks, two formats that your older books may not be in yet. A trade paper edition can be a great adjunct to a book that is mainly selling in hardcover. In the ebook world price drops and price promotions are common, something unheard of for the most part before the advent of the ebook. The landscape has changed dramatically and these new revenue sources have emerged. In my experience, most traditional print publishers are very professional and possess a store of good will towards their published authors. If you pursue these issues contact them with clear and authoritative information. Give them time to respond. Backlist books aren’t always a priority for traditional publishers and exploiting them fully can require time, effort and expense. View them as your partners. If books are out of print and/or your publisher is willing to revert rights to you, revert those rights and make plans to pursue a second life for them. Be patient but be persistent and have sound suggestions for how to help your back list grow. If your publisher is unresponsive insist on a rights reversion so you can support the books yourself. Let me add some thoughts on literary agents who may be a party to these agreements. If the agent or agency is still active and performing services for you all this work can be performed by them or by them in concert with you. Work with your agent but don’t feel that your agency agreement precludes you from pitching in and being an active author. If the agency is inactive or you are no longer in touch with them this can be a burden, but their status in the contracts does not preclude you from pursuing all these issues on your own. Different publishers may feel differently and there may be some protocols to work out but ultimately it is you who signed that agreement, you who granted those rights and you who the publisher is beholden to. Be a diplomat and work to sustain your career, protect your books and earn the income that you deserve. I imagine for many authors thinking about the future of books that they control may be a daunting prospect. It can be. There’s a sea of information out there, but how do you navigate it? How do you make good choices? Do you have the energy, focus, drive and financial resources to pursue bringing these books back into print and managing their future? I want to encourage you to do so. Here is the case I would make. There is money to be made. You may be pleasantly surprised. The cost of creating an ebook paired with a print on demand edition is relatively small and you can find worldwide distribution for it on terms that are attractive on a per book basis. There will be a learning curve where you figure out how to get a new edition of your book created but the information and resources are freely available on the internet. When your book is in print again in whatever editions you can manage you will have a financial opportunity in place that will last literally decades. In addition to the financial potential there is the legacy that you will want to establish for your lives work. Beyond the library or the used book store you can see all your work available for sale, under your control, indefinitely. You can even update, revise and repackage the book if you care to. You have every reason to make the effort to see that your work continues to educate and entertain. Beyond self publishing your book in a traditional print format there may be other opportunities. It’s possible that another publisher will be interested in your work and you can license that work to them, re-launching your work with a new print partner. There are also opportunities in audiobooks, in translation and even in film and television in very rare circumstances. The book world continues to evolve rapidly. Authors should stay current and continue to educate themselves about the opportunities that exist now and that will emerge in the future. It’s your work, you own it and it has potential that you can exploit. The digital revolution has been most consequential for authors and books. Books that used to cost thousands of dollars to reprint, warehouse and distribute can now be re-published inexpensively, a mouse click away for millions of customers worldwide. Don’t miss out. At a minimum, inventory your work. With that in hand, you can plan for the future secure in knowing ‘where your children are’. The advent of the internet and rise of alternative modes of enjoying books has changed the game for authors forever. Legacy publishers built their businesses around controlling distribution to book retailers. While that infrastructure is still important, platforms like Amazon have created a new ecosystem in which authors have more potential for control and opportunities to reach new audiences. This is a story the modern author is familiar with. But what about the not-so-modern author? Or the son/daughter of the deceased not-so-modern author? As covered in Life Plus 70 and Maximizing Your Backlist, publishing contracts include many opportunities for creators to exploit their copyrights over a book’s life course, and many older authors or heirs may not be aware of the untapped value they’re sitting on. Or maybe they are aware and simply don’t have the time or will to do what’s necessary to extract it. Take, for example, the story of Jason Manning. Jason was represented by Royalty Reminder founder and long-time literary agent Ethan Ellenberg. After a successful stretch writing novels in the 1990s, things began to slow down. Twenty years ago, this would have been the end of the story – not so today. Royalty Reminder’s concierge model can provide the same service to you. If you’re an experienced author or heir with a backlist of titles and you want to make sure you’re wringing every bit of value out of your work, we’re here to help. All you have to do is send us your contracts (either in scans or in a literal cardboard box). We’ll analyze them. We’ll load them into our software system. We’ll create digital files, proofread them, and contract cover artists. We’ll publish them on Amazon and other ebook sellers as called for. And we’ll do it with no upfront costs. In return we ask authors for a 30% revenue share of the future profits after deducting the cost of covers and production (no overhead is charged). It’s not just Mr. Manning who has benefited from republication. The Ethan Ellenberg Literary Agency has published 192 titles under the province of his literary agency through KDP agent-supported publishing. 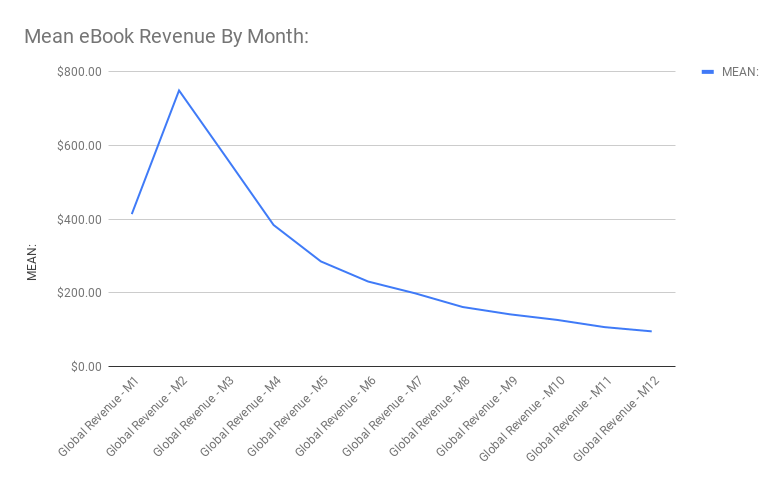 The average title earned over $3,400 in global revenue within the first year alone. For an author using Royalty Reminder Concierge, that nets out to over $2,400 per title in a single year. All the work related to re-publication was performed by the agency, leaving Authors free of all obligations. This is the same model we are proposing here. Below is a graph representing the agency’s success re-publishing backlist titles. We understand that this service is not for everyone. If you want to handle regaining rights and republishing digital copies yourself, we urge you to do so. But we’re here to lend you our expertise and services if that level of effort and headache just doesn’t fit into your life. We love the idea of a new reader connecting with an old book, or someone in Madrid becoming obsessed with an author they otherwise wouldn’t have known existed. It’s an exciting time to be an author, and in many ways, there is more monetary opportunity than ever. It’s time authors of every age and experience level start taking advantage of that fact. We’re here to help in whatever way we can, whether that’s providing the engine for your contract management, or actually helping you through the process of re-publishing old work. It’s a whole new world of Author opportunity for anyone with a backlist and that includes the Estates of deceased Authors. I’ve written this post to provide an overview of what Authors and Heirs should be monitoring and pursuing. For published books with a traditional publisher check the print formats that the book is available in. Is it in the right format or formats (hardcover, trade paperback or mass market paperback). Is it in ALL the print formats it should be? Is there both an ebook edition and an audiobook edition? Your goal should be to make sure every title in the estate has an appropriate print edition, an ebook edition and an audiobook edition. Are the cover prices right? Is the cover right? When was the last time the book was re-issued or re-packaged? The book may have the right cover at the right price but you cannot know that without doing some market analysis and checking with your publisher. Is the ebook edition being marketed? When was the last time it was given any attention like a price drop or some other kind of promotion? Is it part of a series that can be combined into a digital boxed set creating a whole new product? Is the print publisher the licensor of any subsidiary rights? What is the status of those licenses? When the original publisher was the holder and licensor of translation rights it may have licensed some of them and may be sitting on a portfolio of licenses in various states of health. Have they been renewed and new advances been negotiated? Have they expired? Has the foreign publisher been rendering royalty statements and paying royalties? Don’t assume. This can be the wild west. This kind of work can be long and arduous but due diligence does produce positive results. What subsidiary rights were reserved to the Author and hence the Estate when these print licenses were first negotiated? Does the Author or Estate retain ebook rights, translation rights, or audiobook rights? All these rights need to be assessed and exploited if warranted. Ebook and Audiobook rights are particularly ripe for exploitation. Are any of the books in the hands of a traditional print publisher eligible for reversion? This is a key undertaking, if they are, they should be reverted. In the age of ebooks and audiobooks there are low-cost ways to revive these books without a print publisher involved. Is there a literary agency involved with any of these licenses? This is a complex area but every Author and Estate should know who the payees are for all its licenses, and whether the agency is still active and fulfilling its role and what it can be called upon to do on behalf of the Author or Estate. Though it’s very rare, some books may be able to generate new works created by living authors drawing from the Estate’s titles. Performance and other kinds of digital entertainment are also possible, though again this is very rare. The key things are make sure all the titles are in print in all the key formats, print, ebook and audiobook, make sure all the licenses are current, and regain control of all the licenses you can. Books no longer end their lives on ping pong tables at garage sales, with ebook and audiobook editions they can earn royalties indefinitely. I’m sure you recognize the provenance of that title—current Copyright law grants authors a term of the author’s life plus seventy years. It’s an extraordinary grant by any measure and I can’t think of anything comparable in patents or any other system that governs intellectual property. Copyright, however, is only part of what governs the working lives of authors. Far more consequential are the actual contracts and licenses authors enter into, which, as a practical matter, are the real governors of their creative and financial lives. In ‘the old days’, when, for the most part, an author’s only recourse was a print book publishing contract with an established book publisher, there weren’t a lot of choices to make. Your income was tied to the success of your book that was in the hands of a traditional book publishing company. When it went out of print, its active life was essentially over. More choices emerged as authors and their agents gained power and agents began selling translation and movie rights on the author’s behalf, in addition to negotiating the book publishing agreements seeking better terms and fostering competitive bidding. Now we are in a whole new world. There are different ways to be published and author incomes are coming from a far wider range of sources. The standard book agreement that routinely grants the mainstream book publisher a license for the ‘term of copyright’ has to be re-considered. If an author can make more money, have more control, and work with many more customers, his/her career decisions are more attractive, but also more complex and consequential. The first issue to consider is whether mainstream book publishers will consider altering their traditional demand for a license that exists for the term of copyright. There’s no reason for optimism here, but Authors should start thinking about this. It won’t change without awareness and effort. I don’t like to use the word fair, but is it in an author’s interest to license their work for the rest of their life plus 70 years? Wouldn’t a change in this contractual term be hugely significant? Beyond the term of license itself, one has to consider the Out of Print clause and the behavior of the publishers adjudicating it. I won’t explore all the intricacies at this time, and there has been good progress in this area, but more needs to be done. When small quantities of ebooks or a translation license are the only things keeping a book ‘in print’ and hence not eligible for reversion to the author per the terms of the agreement, things need to change. Publishers have to be more responsive to Out of Print requests. They also need to be more flexible in application of the rules. Books that are no longer performing for them should not go through long periods of decay as they age out, but should be reverted to their authors. Additionally, as a traditional book contract ages, the original subsidiary rights granted to the publisher should be eligible for reversion, even if the book itself is in print. Whatever the subsidiary rights are, if they are moribund in the publisher’s hands, they should be eligible for reversion to the author. Beyond what I believe are healthy, necessary changes in the basic terms offered by traditional book publishers, authors need to continue to evaluate the new paradigms that are available to them. These paradigms are already successful and there is reason to believe they will be even more so in the future. Authors can self publish and having retained all the subsidiary rights, license rights to their books to audio publishers, foreign publishers and film/t.v. companies. There are challenges here to be sure, but the self publishing paradigm has been proven successful and the most successful self published authors have sold their rights in all these other formats. Here is where there is a radical change in the legal status of an author’s rights. If they publish an ebook there is often no term of license and the author can change his/her plans at will. Audio licenses vary in length, with licenses of 3, 5, 7 and 10 years being common. Translation licenses also vary in length, with licenses also of 3, 5, 7 and 10 years. With talent available world wide, authors can commission their own audio books and translations. Breakthroughs in print on demand technology may someday soon see printed books available inexpensively at all kinds of locations including coffee shops and salons. –Copyright is life + 70. Your work is protected, its value will last longer than your lifetime. Plan for it. Authors need to organize all their contracts and licenses and realize they are in the intellectual property business, and not just book authors. With ebooks easy to publish and Audio rights in demand, the opportunities are ongoing and inheritable. I’ve been working on the Royalty Reminder software for almost two years. I imagine keeping track of book publishing contracts and figuring out ways for Authors to protect and maximize their income may not grab the attention of that many people but for me it’s been consistently fascinating. The SF writers of the classic age foresaw an economy dominated by massive corporations and to a striking degree, this has all come true. On one hand some gates are down, and many Authors have access to their audiences through the miracle of the internet. But the converse is also true, distribution is concentrated into just a few hands. How will that affect the working book author as the marketplace continues to evolve? Here are a few of my ideas to empower authors and perhaps, all creatives. You’ll see there is a connection to Royalty Reminder and any other enterprise software that aggregates the power of creatives. Data is power. If Authors have real time, actionable knowledge of all their publishing agreements, and that data has the potential to be organized in a way that it can be deployed to enhance their bargaining power in negotiating the terms of its sale and distribution, than they will have greater say over their incomes and potential. Many author’s works are published by traditional publishers, and the traditional copyright based license mitigates against that, but it doesn’t foreclose it. The out of print clause returns many books to authors every year. The traditional publishers desire for new works from those authors will also influence their negotiations with them. Many authors are also publishing under short term or at will agreements and this means a great many books are free at any time to negotiate the terms of their exploitation. So it is possible that authors will be able to aggregate their power in a way that appeals to their inherently freedom loving dispositions. They can keep careful track of all their publishing agreements. They can match those inventories with a digital version of their book that can be almost instantly transferred to a distributor that offers better opportunities. They can participate in communities of authors that support, monitor and market those books. The power of the one can be aggregated into the power of the many. Creatives have always created the books that audiences want and have always struggled to realize their share among their partners that provide capital, production, marketing and distribution. In the digital age, for the independent author, capital, production and marketing are in reach. By aggregating their power and fostering competition among distributors, authors can improve their share of the proceeds. It will be fun to find out.